Just as a reminder, on June 6 (2016) I’d hiked to the Bright Angel Resthouses. 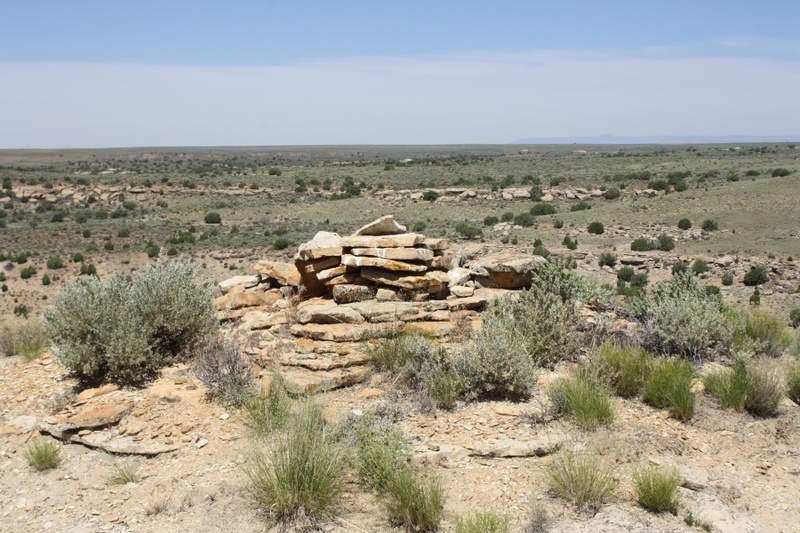 So, on the 7th I drove the 260 miles to the Hovenweep National Monument, which I’d visited the previous year. 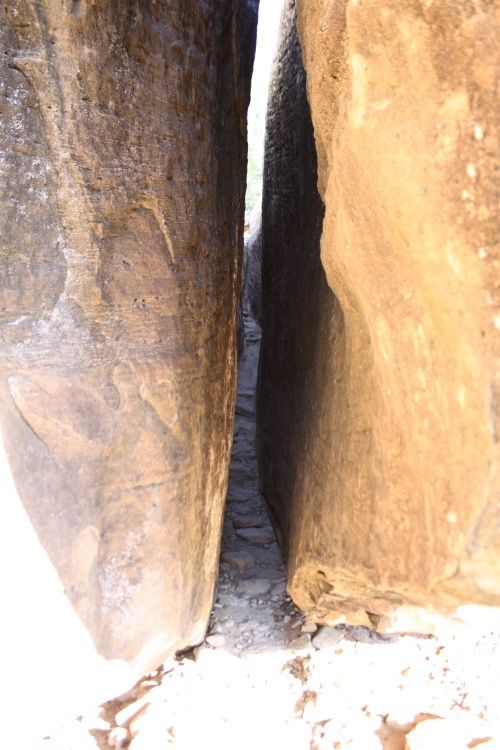 Even as you get close, it’s not obvious that the canyons are near. 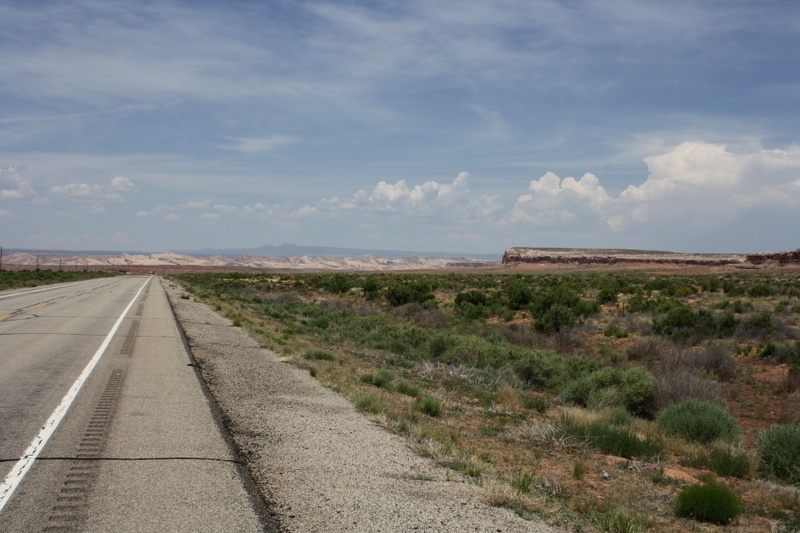 But as I got close, I could see the Bear’s Ears National Monument off in the distance. You ought to be able to see the ears off in the distance. Of course, this National Monument has now been raped by a certain somebody in order to appease the mining interests. 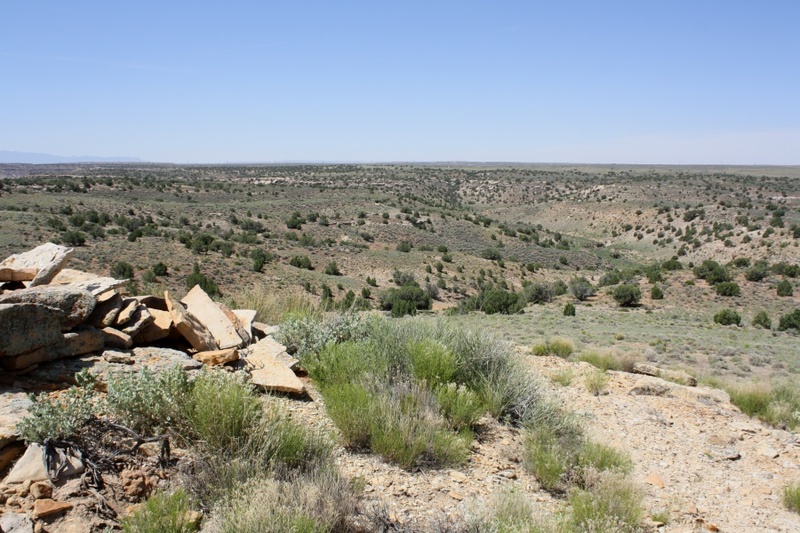 The Secretary shall not make, modify, or revoke any withdrawal created by Act of Congress; make a withdrawal which can be made only by Act of Congress; modify or revoke any withdrawal creating national monuments under the Act of June 8, 1906 (34 Stat. 225; 16 U.S.C. 431–433); . 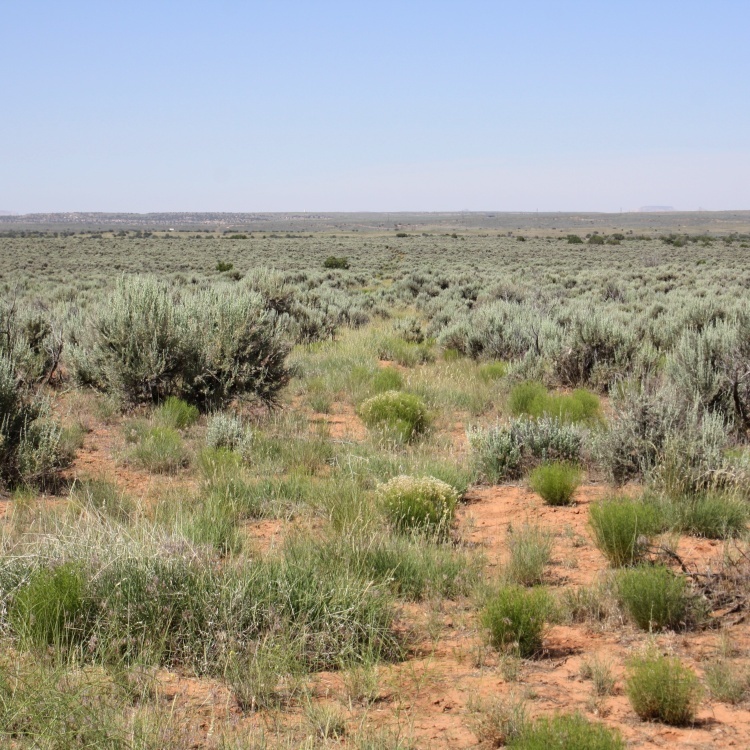 . .
“Withdrawal” means withdrawing Federal Lands from being multi-use. Since National Monuments restrict the use of Federal Lands (e.g., no mining) creating a National Monument is a “withdrawal”. The “Act of June 8, 1906” is the Act that gave the President the authority to create National Monuments. Thus, it seems quite clear to me that undoing Bear’s Ears (and Grand Staircase/Escalante) violates the law and ought to be overturned in any court case. Only Congress has the authority to undo the designation of a National Monument. Sorry. 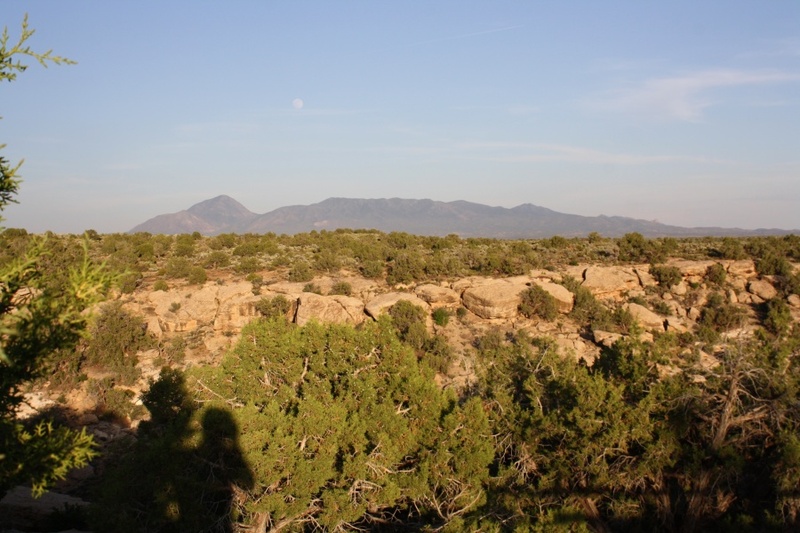 Returning to my trip last June, as I got to the Hovenweep campground, I was greeted by an old friend, Sleeping Ute Mountain. 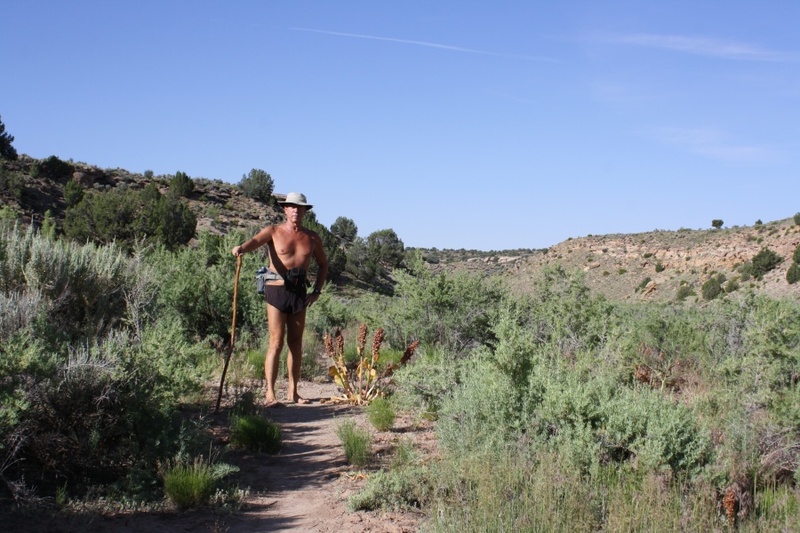 The next day, I took the Keeley Canyon hike. This leaves directly from the campground. (Somehow, last year I didn’t manage to get around to doing it.) Of course, I wasn’t just going to do the official out-and-back. I had other, more challenging and interesting, plans. Here’s the topo map of the hike and the area. 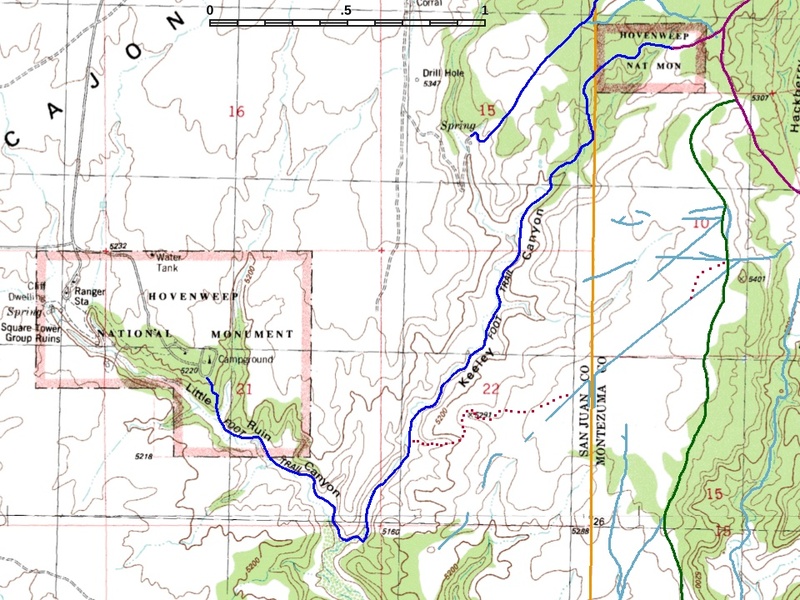 You can see that the trail (blue) leaves from the campground, heads down Little Ruin Canyon and then up Keeley Canyon to the Holly Unit of Hovenweep. 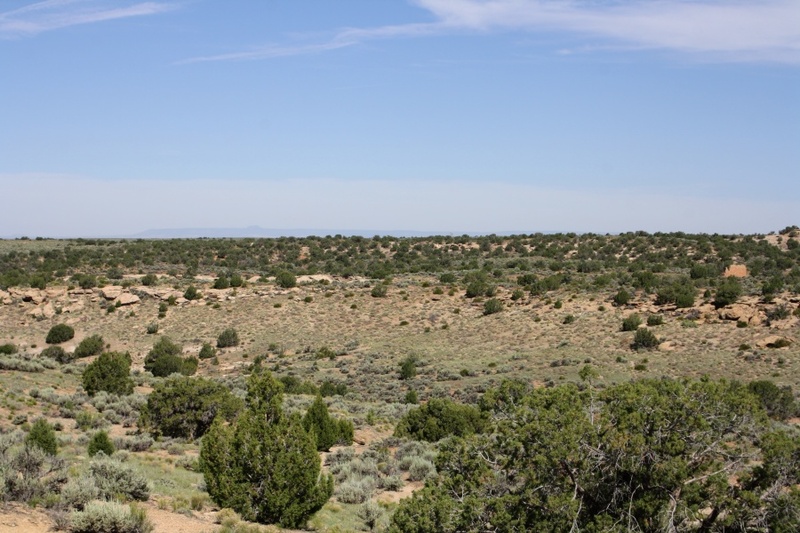 After leaving the Little Ruin Unit of Hovenweep, it traverses generic BLM (Bureau of Land Management) land until it crosses the border from Utah to Colorado (the orange line). 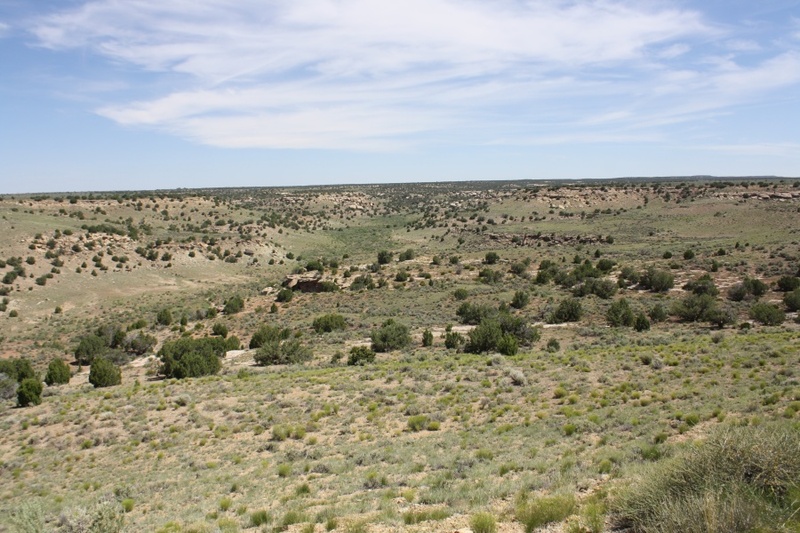 East of that line is the Holly Unit, and the rest of the territory in Colorado there is Canyons of the Ancients, also administered by the BLM. 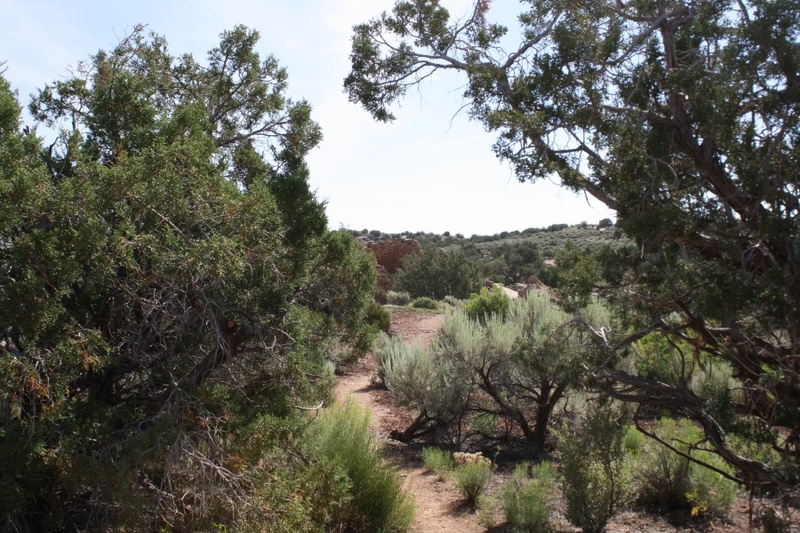 My plan was to take the official trail to the Holly Unit, and then explore other trails and bushwhack my way back. 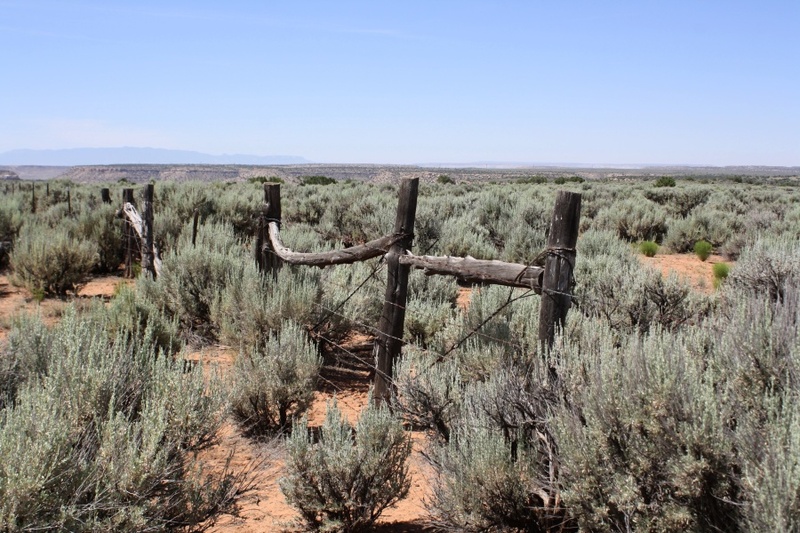 While it is prohibited to leave the trail within Hovenweep, as far as I knew, that’s not prohibited on BLM land (and definitely not prohibited in the Canyons of the Ancients). What is prohibited is disturbing any ruins, and I had no intention of doing that. The only thing I was going to touch those with was my camera (if I came across any). Here’s just past where the trail starts. There are a lot of canyon-like cliffs there (40 feet high, maybe). 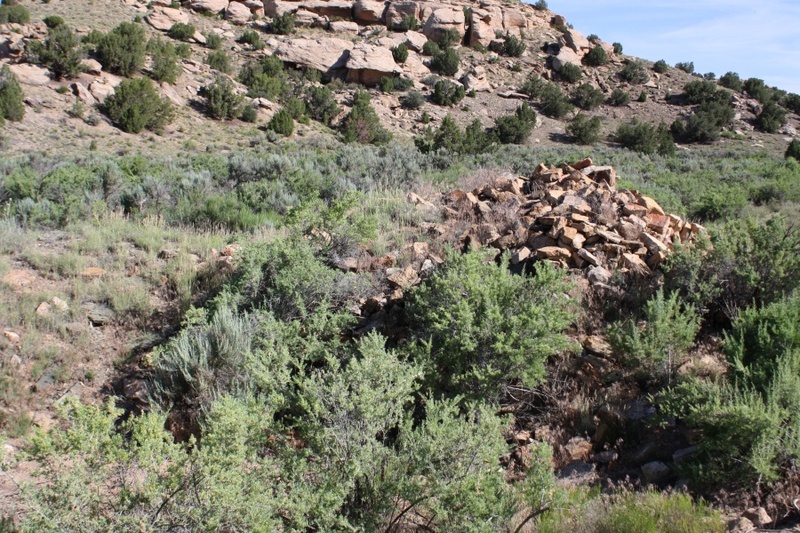 While there are stone cairns to mark the trail, it’s not always clear. I spent a bit of time looking around before I figure out I was supposed to go through this. (Photo taken from the bottom after I went through.) From then on the trail was well-marked, with a decent “hint” of when to head north along Keeley Canyon. Here I am on my way north (where I came from is behind me). Here’s the view looking ahead. You can see that this place really isn’t all that canyony, unless actually trying to climb it. Along the trail was a small ruin. There was a small sign just reminding folks not to touch it. It took me about two hours to make it to the Holly Unit. When I’d visited last year, I’d driven to the east entrance and then walked in. This time, I was coming up the canyon and came in at the west entrance. Hiking along, the next thing I knew, this was what I saw. That’s the back side of what I saw the previous year (2015), when I had come from the other direction. From there, I revisited the rest of the Holly Unit and exited at the east. From there the plan was to head south a short distance on the purple road (4721) and then grab the green path (unnumbered) from which I could eventually head southwest back to the Keeley Canyon trail. Just about the point where the green trail heads south, there was a good view back towards the Holly Unit and the start of the canyon. To the right you can see one of the Holly Unit ruins. In the distance you can see the Bear’s Ears (actually, just one of them, since from this angle they are lined up with each other). Continuing south on the green trail, my intent was to take that light blue trail (which I had “scouted” out using the Google satellite view) that headed directly southwest. But when I got there, all I could see was this. And yes, I was it the right spot. I could tell from the curves in the path and the high spot to my left. 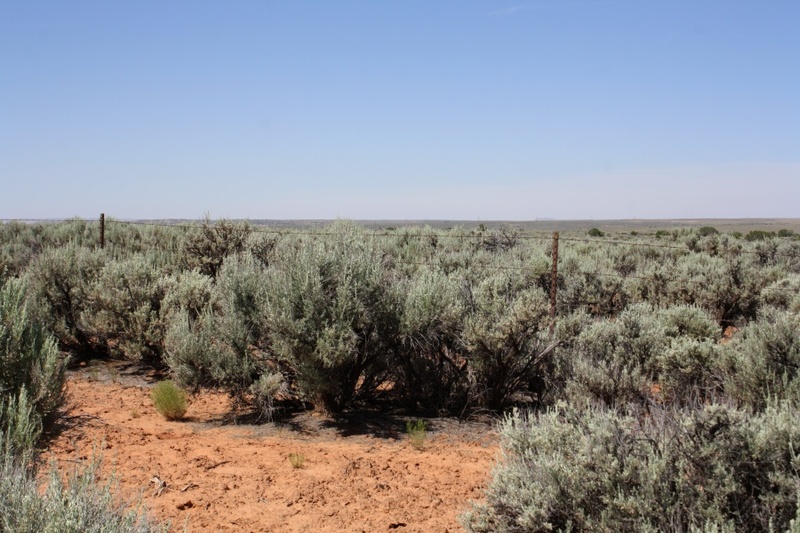 So decided just to bushwhack it through the sagebrush. Did I pull out my compass? Heck no, that’d be cheating (until/unless I really needed it). There was that mesa off in the distance at about the right angle. All I had to do was keep it slightly to my right and I would have the correct bearing. Eventually, keeping that bearing (and deliberately veering off it left and right in a bit of a search pattern), this is what I saw. From here all I needed to do was head to the border. Look at that map again. See if you can figure out what the heck is going on at the border with Utah. Why would the light blue path turn south at the border, go a ways, then head back north and rejoin its former path? I had an idea. When I got to the border, my way was blocked by a barbed-wire fence. That explained the break in the path (and was what I expected to find). As I said, I had an idea. And I was right. After traveling south I got to what I expected. Of course, that explained what I’d seen from the aerial view. From there I more or less bushwhacked to try to hit that little promontory (5291 feet above sea level) overlooking Keeley Canyon (follow the purple dots). Off in the distance, looking almost due west, this is what I could see. 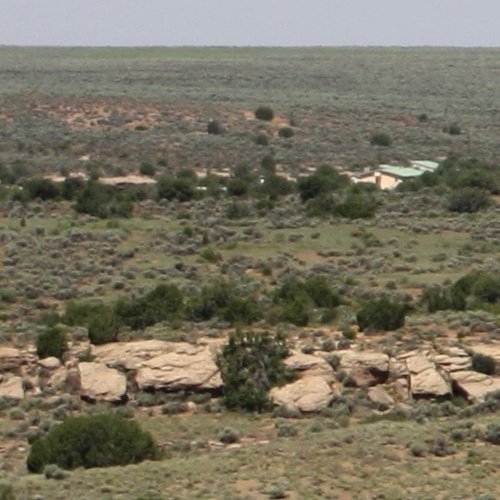 Those were pretty obviously the administrative buildings for Hovenweep and its campground. So, that gave me confidence that I was right where I thought I was (and wanted to be). As I approached the point of the promontory, this is what I saw. More ruins. It’s actually a pretty obvious spot for ruins. Maybe it was a lookout of some sort, because I had a great view both up and down Keeley Canyon. Or maybe it was a place of ritual. (Archaeologist joke is that any place or thing you don’t know the purpose for you describe as for a “ritual”.) Here’s the view up-canyon. 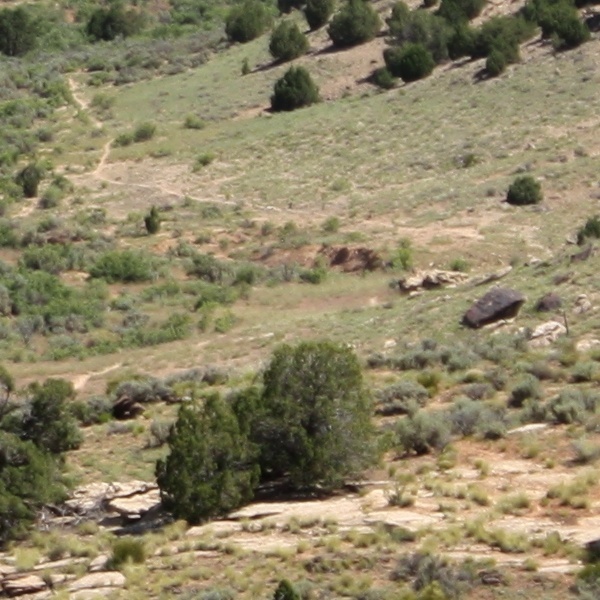 With a little bit of zoom you can see the path I’d taken heading up-canyon earlier. 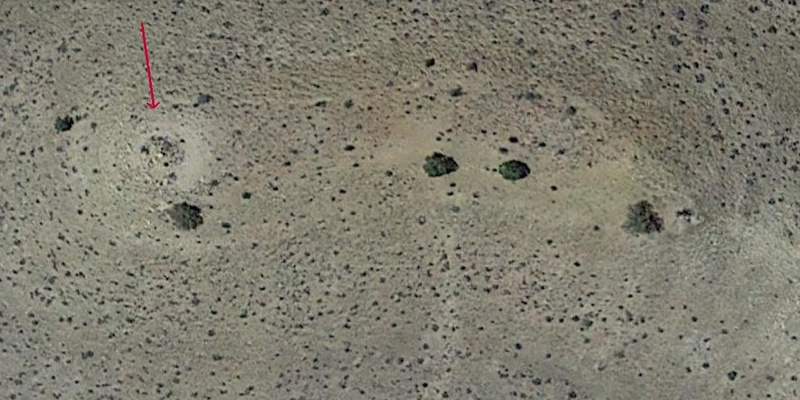 After I got home I looked at the Google aerial view to see if I could find those ruins. Yup, there they were. Here’s the view looking down-canyon. 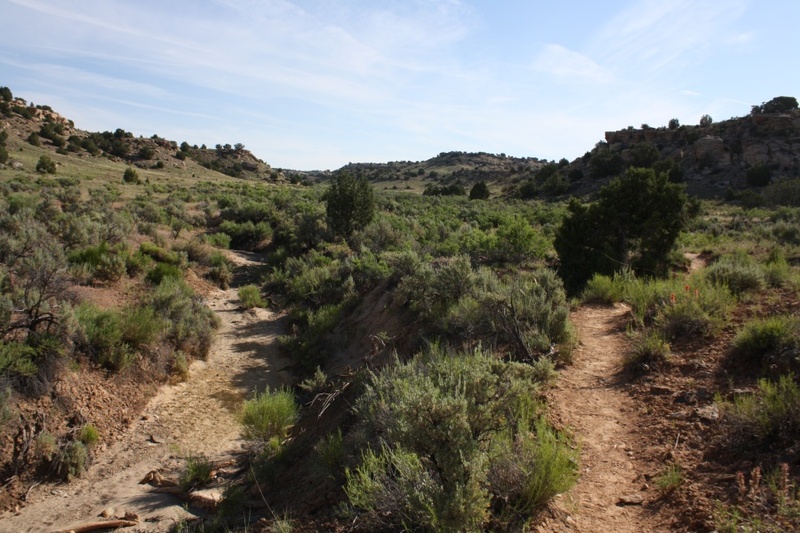 Aside from seeing the ruins again, if you know where to look you can also see where the path is, and you can see where Little Ruin Canyon (the path back to the campground) comes in from the right. Now the only trick was to get down there to rejoin the trail. There was actually a fairly steep traverse to make before getting to the bottom. I arrived at the top of that. Fortunately, I could see that the other side of it (where I’m taking the picture from) was fairly benign, so that’s the way I headed to rejoin the official trail. 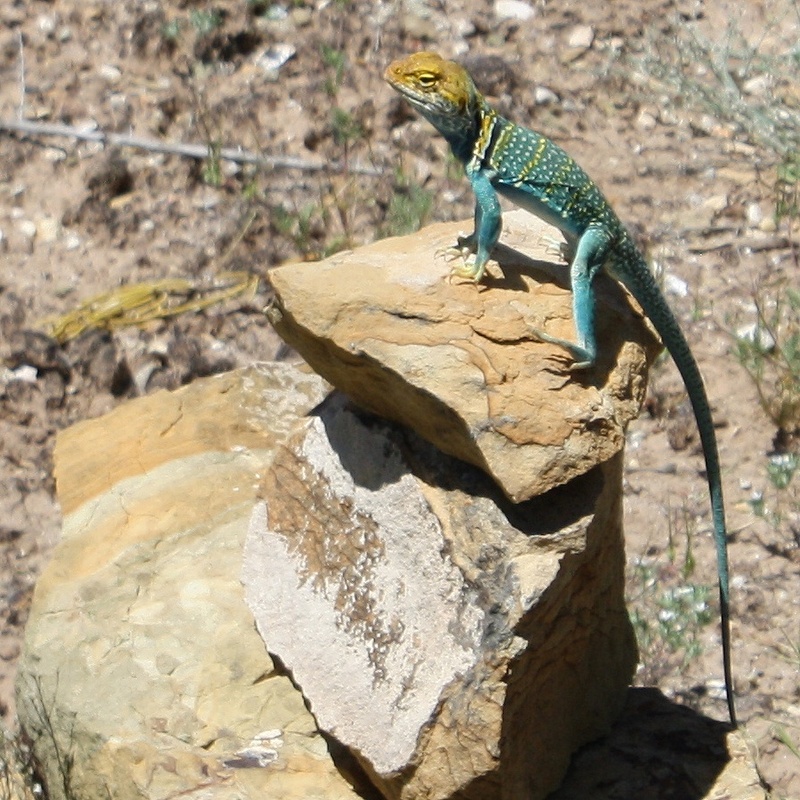 Just about when I headed up Little Ruin Canyon, I came across this Collared Lizard. The rest of the way back got a little . . . interesting. 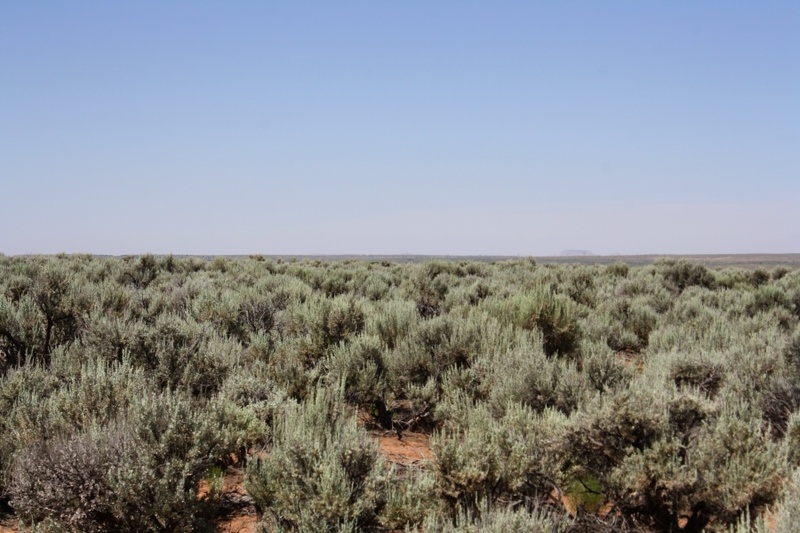 So I worked my way back in 100 yard jaunts, stopping when needed with my feet in the shade of a sagebrush. That worked, and I made it back to the campground OK. I thought that that was a really fun hike. 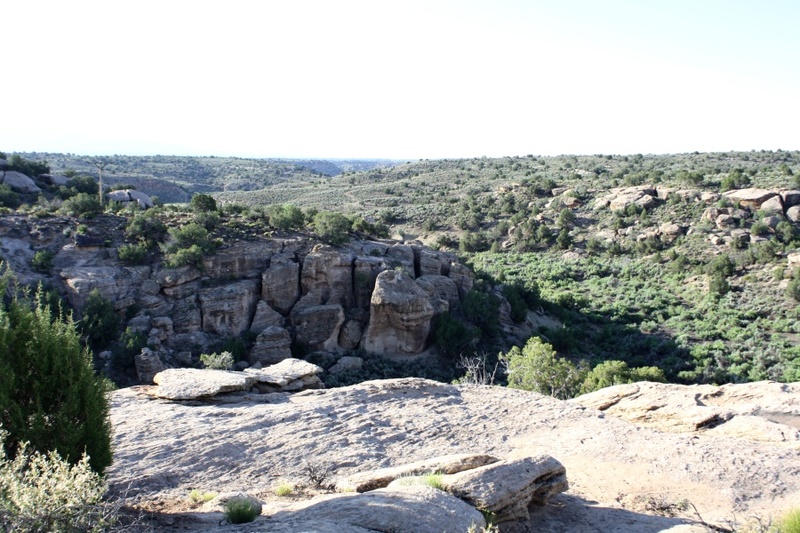 Great ruins to visit, a new ruin, successful bushwhacking and route-finding, and neat views. I couldn’t have asked for more. But I got it. 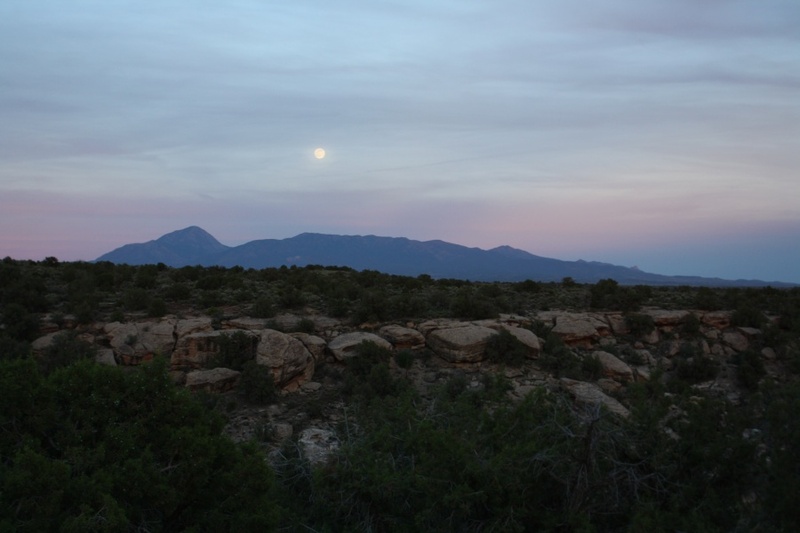 That night, the Sleeping Ute put on another great sunset show, and this with a nearly full moon. Oh, the lizard is a real beauty (I’ve always had a thing for snakes and lizards). Plus, I envy you the courage to travel such vast, distant, uninhabited lands. The views are spectacular, the feeling of being a tiny part of the great universe must be an overwhelming and almost transcendent experience, and I can imagine that. Yet, left alone “in the middle of nowhere”, I’d immediately panic and turn into a crying ball of misery. It must be some kind of brain disorder which I can’t help no matter how much I’d like to.